NASA's Opportunity Mars rover, also known as "Oppy", is continuing its traverse southward on the western rim of Endeavour Crater despite computer resets and "amnesia" that have occurred after reformatting the rover's flash memory. The problems have forced the controllers to switch the robot to a working mode that avoids use of the flash data-storage system. In the no-flash mode, the rover can continue normal operations of science observations and driving, though it cannot store data during the overnight sleep. The good news is, the restoring of the rover's flash memory will begin soon. "Testing of a work-around to mask the faulty bank of flash will begin shortly after the Christmas-New-Year break," Guy Webster, NASA's Jet Propulsion Laboratory (JPL) spokesman told astrowatch.net. 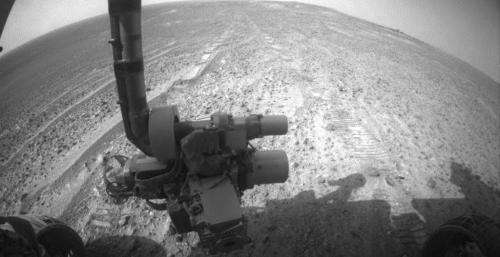 "Both Spirit and Opportunity began experiencing faults related to flash within a few years after beginning to work on Mars - after working more than a dozen times longer than planned lifespan," Webster said. He noticed that late January 2015 will mark completion of 44 times the Opportunity mission's original planned operating life on Mars. Opportunity is currently examining outcrops on the western rim of Endeavour Crater while traversing southward toward "Marathon Valley," where clay minerals have been detected in observations by NASA's Mars Reconnaissance Orbiter. But what about other scientific instruments on board Oppy? "The miniature thermal emission spectrometer is not used any longer; dust accumulation on a mirror complicated interpretations. The radioisotope source on the Moessbauer spectrometer has gone through too many half-lives for that instrument to be practical for use any longer, since each reading would take weeks. The radioisotope source on the alpha particle X-ray spectrometer has also diminished considerably, so that readings now take longer than they did in the first few years. It is still used and useful, though, and the other instruments are still OK," Webster revealed. They seriously got their moneys worth out of this mission. Ten years plus and still returning data, incredible.